After collecting and refurbishing IBM's Model F keyboards for years, Joe Strandberg decided he wanted to start manufacturing them. Joe Strandberg of Garden City, N.Y. loves this keyboard so much that he has independently worked to re-manufacture it. With his project, he outlines all of the mechanics that go into creating "the best keyboard ever," and how he's striving to make "a perfect, working reproduction." In today's market, the original keyboards would have cost around $600, but Strandberg's models will cost about $300. In an interview with NPR's Kelly McEvers, Strandberg explains why people think the Model F is a big deal and how it differs from the keyboards of today. Well, I think that it's the best keyboard ever because it has a delicate, yet incredibly tactile response that makes typing a pure pleasure. It's got this sound — it's kind of a musical interaction when you're typing. Well the first thing is, it's a lot heavier. The cases are actually made of metal and the metal is painted on top, so it's kind of like an 8- or 9-pound block. It's also got a different layout from the modern keyboards. 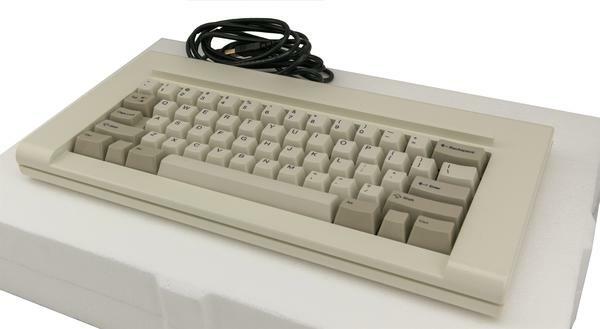 It's basically if you take off that top row of function keys and you take off the keys on the side of the number pad, you get the old Model F Keyboard. This is kind of like a night and weekend hobby. I got into keyboards several years ago. I just started collecting and restoring these old Model F keyboards and I just fell in love with the sound and the feel and just the comfort and it's kind of turned into something beyond what I would have ever dreamed. Some people love it and some people hate it because it's definitely the sound of the 1980s office. Like if your boss was near and they could hear you typing away, they would know you were being productive. I guess today the trend has been more for quieter or silent keyboards and that's just because back in the day you had the ability to have a keyboard that could cost $600 to make when you were buying a computer that was $5,000. Now, with all the cost cutting, computers are so much cheaper — a keyboard nowadays is about $5 to make. This sound comes from the past. A trained ear would be able to tell you it's coming from the IBM Model F keyboard. JOE STRANDBERG: It's definitely the sound of the 1980s office. Like, if your boss was near and they could hear you typing away they would know you were being productive. MCEVERS: That's Joe Strandberg of Garden City, N.Y. He's one of many computer collectors who have a lot of feelings about the Model F keyboard. STRANDBERG: I think that it's the best keyboard ever because it has a delicate yet incredibly tactile response that makes typing a pure pleasure. It's got this sound. You've got two huge pieces of steel. You have some flippers slapping and resonating between two metal sandwich layers inside. It's kind of a musical interaction when you're typing. IBM stopped making the Model F in the mid-'90s, so they're hard to find. You have to troll thrift shops or eBay. And if you happen to find one, it's not very easy to get it to work with a modern computer. MCEVERS: So Joe Strandberg decided to remanufacture the Model F. When he learned someone in New Zealand had invented a controller that could make the Model F more easily compatible with new machines, he had an idea. STRANDBERG: That kind of inspired me to think, hey, we can make these great old keyboards and get them in the hands of people where they can just plug it in and start using it. They don't have to spend hours cleaning it up and reconfiguring it and reprogramming it. They can kind of just open up the box and start using it. MCEVERS: Strandberg dismantled the Model F and redrew the designs. Then he found a factory in China to make it. Luckily, IBM's patent has expired. SHAPIRO: Strandberg set up a website, and he has received hundreds of orders already. He's not quitting his day job, though. This will be a limited run. STRANDBERG: This is kind of like a night and weekend hobby. It's kind of turned into something beyond what I would have ever dreamed. MCEVERS: It's not cheap. It costs more than $300. But Strandberg says this is a piece of equipment built to last, and one that IBM spent millions to develop. SHAPIRO: The original price tag for the Model F was $600 adjusted for inflation. Hey, if you want the Cadillac of keyboards, you've got to be ready to pay a Cadillac price. (SOUNDBITE OF KEYBOARD CLACKING) Transcript provided by NPR, Copyright NPR.